Density of water = 1000g/m3 Kinematic Viscocity = 8.6 x e-4 m2/s Sp. Heat = 4.179 KJ/Kg.K Thermal conductivity = 0.62 Ts = 3530K T∞ = 2980K m = Mass flow rate of water = 0.80 kg/sec T1 = 298 K Dh = Hydraulic dia (m) = 4A/P Hypothetical Calculation Presently, to make hypothetical computations, taking after presumptions are required to make logical counts. 1. The warmth is convected from hot surface as it were. 2. The warmth exchange ange by conduction of plate is disregarded. 3. The warmth exchanged to chilly water as it were. The Heat Balance for the plate is given by, Heat convected by Surface = heat gained by the water, hA(Ts - T∞) = mCp(T2 – T1) Where, h = Heat transfer coeffi in W/m2K Ts = Surface temp. of plate T∞ = Final temp. of plate m = Mass flow rate of water in kg/s Cp = Sp Heat of water in KJ/KgK T1 and T2 = Inlet and outlet temp. Of water In the above equation to find out heat transfer coefficient required for convection. convec The heat transfer coefficient can be obtained by, considering following properties. 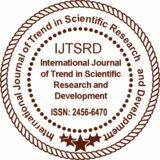 International Journal of Trend in Scient Scientific ific Research and Development (IJTSRD) ISSN: 2456-6470 2456 3. FINITE ELEMENT ANALYSIS Transient warmth exchange choose temperatures and other warmth sums that change after some time. The assortment of temperature flow after some time is of energy for a few applications, for instance, with cooling of electronic groups or aasmothering examination tion for warmth treatment. Moreover of interest are the temperature movement realizes warm weights that can achieve disillusionment. In such cases the temperatures from a transient warm examination are used as commitments to a fundamental examination for warm arm uneasiness evaluations. Transient warm examinations can be performed using the ANSYS solver. chosen and score of 4 x 4 mm is made as appeared in model. The liquid area is made amongst plate and section. A convection is given to the surface of score. The limit conditions of the surface temperature is 900C and the cooling water bay temperature is 250C. The yields are characterized by the outlet temperature of cooling water if the plate is cooled by 100C. The temperature counters and stream lines are indicated for examination of results. The figures underneath demonstrates the outcomes for the models of cool plates. Final outputs are shown in following figures. From thee cfd analysis temperature distribution was plotted. International Journal of Trend in Scient Scientific ific Research and Development (IJTSRD) ISSN: 2456-6470 2456 is within the safe limit. Other model 4 cold plate obtained temperature of 348 K which shows less heat removal rate. Conclusion The physical characteristics shown in the results are different in each model. From the above results the heat removal rate is more in Model 3 cold plate. When comparing the four cold plates, model 3 cold plate have more contact area to the source, source than other three cold plates. By considering these results the behavior showed by the model 3 cold plate is within the safe temperature limit. This is due to carry the more amount of heat according to design of model 3 cold plate and finally this is the best method of cold plate to maintain the industrial equipment in a safe desired conditions. This concludes that, the optimized method i.e. model 3 cold plate can be adopted for f heavy electronic equipment and naval applications. REFERENCES 1. Encyclopedia of thermal packaging Volume 2, Air and Liquid-Cooled Cooled Cold Plates, Jan 2015. 2. Wenjun Liu, Hauck Torsten and Josef Drobnik, “Effective Thermal Simulation of Power Electronics in Hybrid d and Electric Vehicles”, World Electric Vehicle Journal Vol. 5 - ISSN 2032-6653, 2012. 3. Paisarn Naphon, Somchai Wongwises, Songkran Wiriyasart, “On the Thermal Cooling Of Central Processing Unit of the PCs with Vapor Chamber”. International Communications Communicat in Heat and Mass Transfer 39, 1165–1168, 1168, July 2012. 4. Satish G. Kandlikar and Clifford N. Hayner, “Liquid Cooled Cold Plates for Industrial HighHigh Power Electronic Devices - Thermal Design and Manufacturing Considerations”. Heat Transfer Engineering, 30: 12, 918 – 930, June 2010. 5. Javier A. Narvaez, Hugh Thornburg, Markus P. Rumpfkeil, Robert J. Wilkens, “Computational Modeling of A Microchannel Cold Plate: Pressure, Velocity and Temperature Profiles”, International Journal of Heat and Mass Transfer Transf 78 (2014) 90–98, 98, July 2014. 6. Feng Zhou and Ercan Dede , “A Novel Design of Hybrid Slot Jet and Minichannel Cold Plate for Electronics Cooling”, Conference Paper, March 2015, DOI: 10.1109/SEMI10.1109/SEMI THERM.2015.7100141. International Journal of Trend in Scient Scientific ific Research and Development (IJTSRD) ISSN: 2456-6470 2456 7. 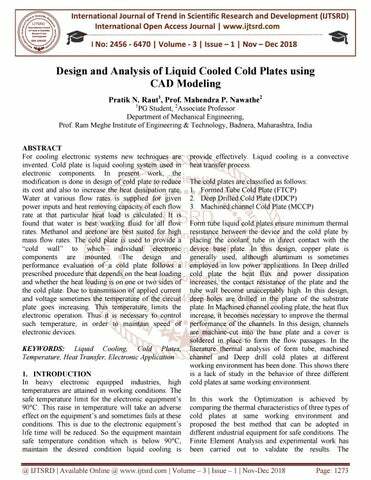 Kanchan M. Kelkar, Suhas V, Patankar, nkar, “Analysis and Design of Liquid-Cooling Cooling Systems Using Flow Network Modeling (FNM)”. International Electronic Packaging Technical Conference and Exhibition July 6-11, July 2003. 8. Hsiao-Kang Ma, Bo-Ren Ren Chen, Jhong Jhong-JhihGao, Cheng-Yao Yao Lin, “Development of an OAPCP Micropump Liquid Cooling System in A Laptop”, International Communications in Heat and Mass Transfer 36, 225–232, Jan 2009. 9. Y. P. Zhang, X. L. Yu, Q. K. Feng, R.T. Zhang, “Thermal Performance Study of Integr Integrated Cold Plate with Power module”, Applied Thermal Engineering 29, 3568–3573, 3573, June 2009. 10. Hsiang-Sheng Huang, Ying - CheWeng, Yu - Wei Chang, Sih - Li Chen, Ming -TsunKe, “Thermoelectric Water-Cooling Cooling Device Applied to Electronic Equipment”, Internat International Communications in Heat and Mass Transfer 37, 140–146, Sept 2009 .